As I was reading my daily devotion from Proverbs 31, the writer challenged the readers to study certain women of the bible. This particular devotion was about mentoring. We as women should be seeking mentors in our younger years and seeking to be mentors when we are older. Life is tough. Being a young wife and mother is tough. Oh how I enjoyed the help and advise of wives and mothers that have been in my shoes. Somehow the fear and anxiety would melt away knowing that I wasn’t the only one struggling. I wasn’t the only one who felt like I had no idea what I was doing. I wasn’t the only one who thought my children would be ruined forever. Anyway, I thought that studying some of these great women was a good idea. I’ve never really done that. Then as I was thinking about which woman I would start with. I also thought that as I learn from these women of old, I would share them with my readers. Whether you are a believer in Jesus as your savior or not, I believe there is something we can learn from these women who have been in our shoes. Ruth was a Moabite married to one of the sons of Naomi a Judien. During the time of famine Naomi losses her husband. Then her two sons a while later. Naomi decided to return to Bethlehem and told her two daughter-in-laws to return home to their parents. She was too old to marry and have more sons for them to marry. The one daughter-in-law, Orpah chose to go home, but Ruth chose to stay with Naomi. God’s word says to honor our mother and father. I am sure this probably stretches to our mother and father-in-laws as well. Here we see Ruth choosing to honor her mother-in-law even though she is not obligated to any longer. The book doesn’t tell us why Ruth chose to stay, but I assume she loved Naomi dearly. She probably felt that staying with Naomi would also honor her late husband as well. She probably felt close to him when she was with Naomi. Ruth asks her mother-in-law for permission to go gather food. Interesting.. She’s a grown woman asking for permission. Regardless, Ruth gets right to work caring for her MIL. Not expecting Naomi to handle things because she is the older of the two women. The mom peruse. That tells me that Ruth was a hard working woman. Willing to do what ever it took to care for herself and Naomi. Because Ruth was faithful to Naomi, word got around town quick. Boaz blessed Ruth because of her faithfulness to Naomi. In turn Ruth became faithful to Boaz as well. She showed her faithfulness by staying in his field only. She showed Boaz honor and respect by bowing down low to the ground before him. 5 “I will do whatever you say,” Ruth answered. 6 So she went down to the threshing floorand did everything her mother-in-law told her to do. Naomi obviously feels Ruth should live her life separate from herself. I think that is sweet of Naomi. She feels Ruth needs a man and takes it upon herself to find her one. Oh what a mother thing to do. Maybe they have intermingled in town or something and maybe Boaz showed interest in public that only Naomi could see. Regardless she picks Boaz for the perfect suitor for Ruth. Naomi devises a plan and Ruth seems to calmly agree with that. I am sure there was more to the conversation than, “Go to Boaz.” “Okay mom, whatever you say.” These are women for goodness sake. I’m sure there was a little bit of giddy laughter form both of them and then the butterflies probably settled into Ruth’s stomach. Maybe even fear. It was obvious that Boaz showed interest in Ruth, but who knows if his interest was for a wife. But Ruth obeys Naomi and fearlessly follows the directions and goes to Boaz. 15 He also said, “Bring me the shawl you are wearing and hold it out.” When she did so, he poured into it six measures of barley and placed the bundle on her. Then he went back to town. We learn that Boaz is an honorable man. A great choice for Ruth. He knew that he wasn’t first in line to Ruth and her family. He is honest with Ruth and let’s her know he will talk with the other relative in the morning. If he isn’t interested in redeeming Ruth then Boaz is more than willing. Ha! We learn that I am a hopeless romantic. lol No really, we learn that Ruth and Boaz get married and start a family right away. We also learn that all the women in town are very excited for Naomi, because she took the baby and cared for him. I assume his nurse maid. Lastly, we learn that this son of Boaz and Ruth is a direct descendant to Kind David and to Christ! As women we can use the story of Ruth and Naomi to remind us to honor our parents and our in laws. God has put them in our lives and we should honor them as we do our own. We are also reminded that it’s important to work hard and care for those we are in charge of caring for. We are reminded to be faithful and to trust the people that care for us as well. Lastly we are shown here to trust the Lord and when he opens a door we should fearlessly walk though it. Good things come to those who trust in Christ. What’s your favorite woman of the bible? 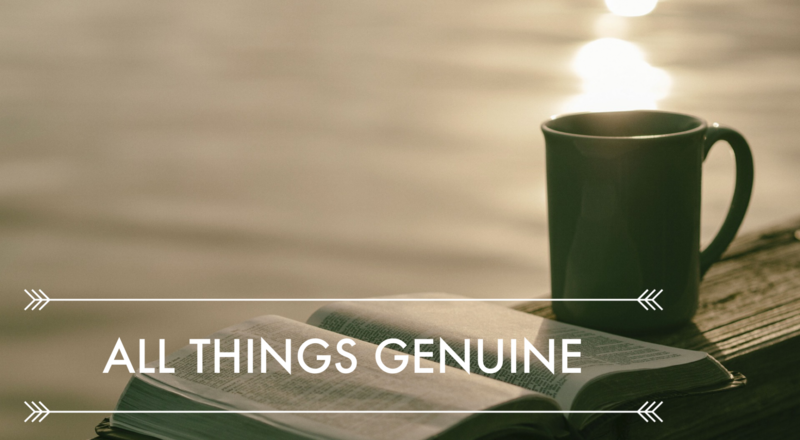 Let me know and don’t forget to sign up to receive All Things Genuine in your email inbox once a week. I will be writing about a few more women of the bible in the weeks to come.